is designed especially for you. It’s a brand new course, so here’s your new course coupon - AFFINITY_FAST . Apply the coupon to get the course for a massive discount. This coupon lasts until the end of November 30th. Everything you need and nothing you don't, all in one 3.5 hour course that gives you pro level techniques in record time. What's more, I provide you with a PDF containing summaries of all the lessons, along with screenshots to help. So you don't even have to make notes because I've done it for you! Well actually, there's two PDF files. The main one contains bullet points of the main points covered in all the lessons, complete with an index so you can search for a particular word or tool. In addition, I'm also including a PDF all about the different layer blend modes available in Affinity Photo complete with descriptions plus a screen shot for every mode so you can really nail down your knowledge. 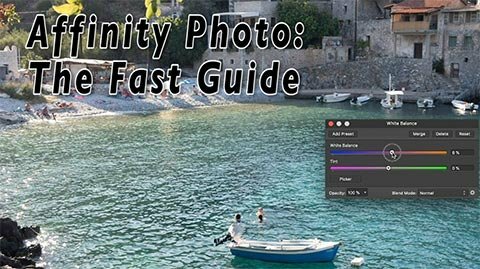 This course has been designed to fit in with various other Affinity Photo courses I offer here at Udemy so you if you want to further your knowledge after this course, I've got you covered. This course may be for people in a hurry. But I still bring the same philosophy to this course as I do to all my courses. Knowing what a tool does is not enough. You have to know why and when to use it. That way you gain skills as well as knowledge. I'll give you both in record time. So click on the link above and enrol today. Professional instruction, delivered in record time!